We are inspired by beautiful buildings. We create them, preserve them & love them. We would love to connect with other people who care about historic preservation, architecture, or building aesthetics. The block you see below is now almost completely vacant. Courtesy of Google maps, we can see all of the structures that used to exist, dating all the way back to 1898. These were once grand Victorian homes, full of real people with real stories. Right smack in the middle of it all was a 1903 Colonial Revival Church. Now, thanks to our unenforced vacant building ordinances, they are gone. This is the current situation in San Jose, California. If you are a vacant historic building, your days are numbered. 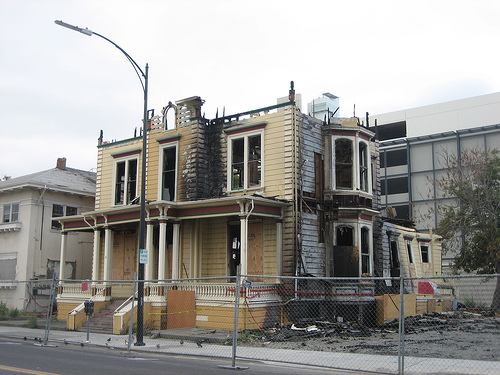 Just since moving to my neighborhood in February, 2010, I have witnessed 2 suspicious fires to vacant buildings, one of which was slated for inclusion in the National Register, 3 needless teardowns of Victorians, and plenty of other troubling activities. 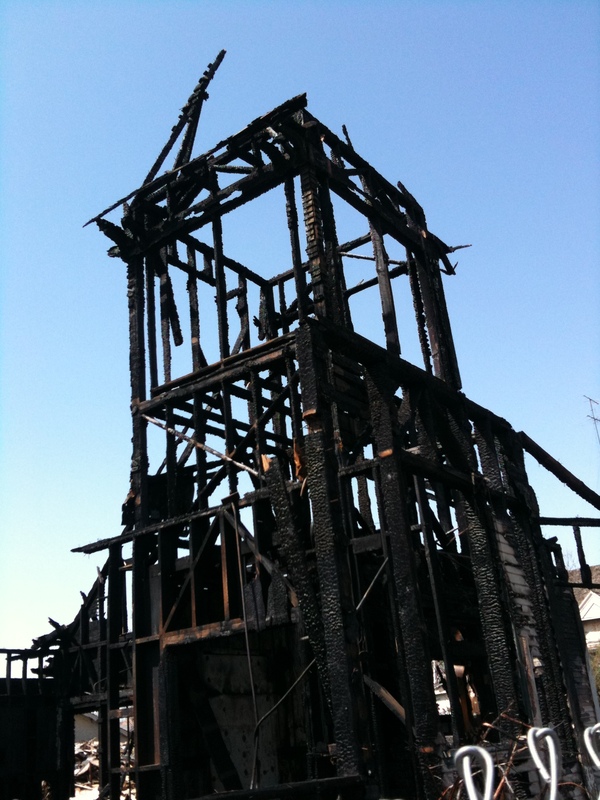 A suspicious fire on March 23, 2010 consumed the 1903 church on Delmas Avenue. After the discovery of asbestos, the fire investigation was delayed. There has been no news about the cause since. The church was to be saved and restored, and put on the National Historic Register. The fire changed all that. Sadly, after the church burned, all of the surrounding vacant Victorians were unceremoniously torn down, one after the other. They had been slated for demolition by the owner of the parcel, Mark Robson and Delmas Park LLC. 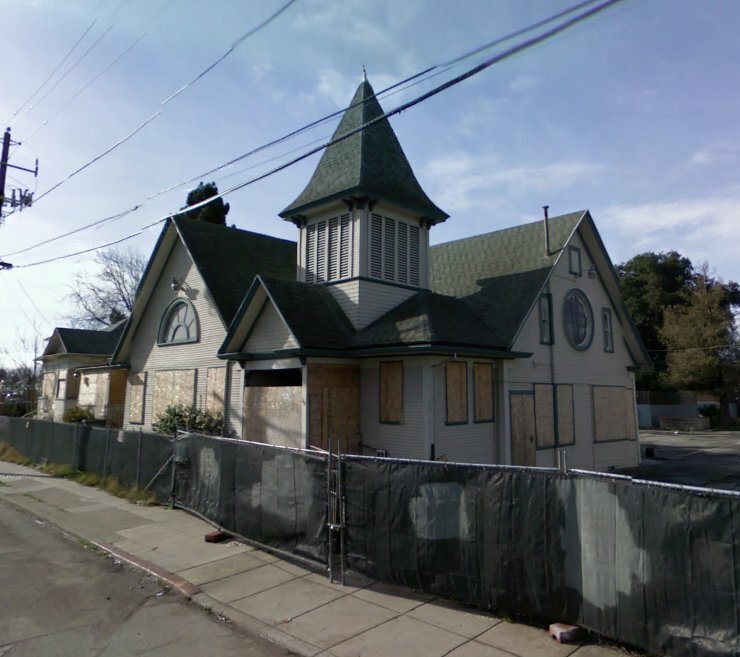 There will never be another 1898 Queen Anne Victorian at the corner of Delmas and Park Avenues. [See below]. German immigrant Louis Bauer acquired the lot at the corner of Delmas and Park Avenue (201-203 Delmas) in 1898 and built his Queen Anne style home. He added a store several years later. Bauer was a well-known and respected community member who owned a popular saloon on the Alameda among other investments. Before living in this neighborhood myself, I had watched his poor home languish for 10 years on the corner. Widow Mary Kerr bought the 253 Delmas lot in 1901. She hired architect William Klinkert and contractor D. A. Charteier to design and build her six-room, $1200 home. A newspaper article featured her home as an example of the pretty homes being built in the district. John Peschal bought the 255 Delmas lot in 1904. His contractor was the firm of Baron and Woehl. Peschal was a clerk for the popular downtown saloon, “The Tower”. Although all of these buildings could have been moved and salvaged, they were not. A few blocks away, River Street is being revitalized. Little Italy San Jose could have used some nice Victorians for filling in blank spots. Check them out on Facebook at Little Italy San Jose. 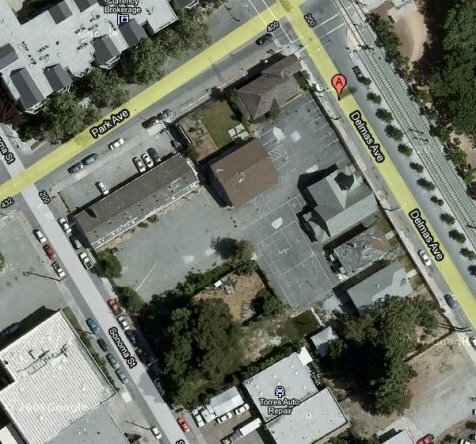 Only a few blocks away, JNSJ Roofing Co ‎. 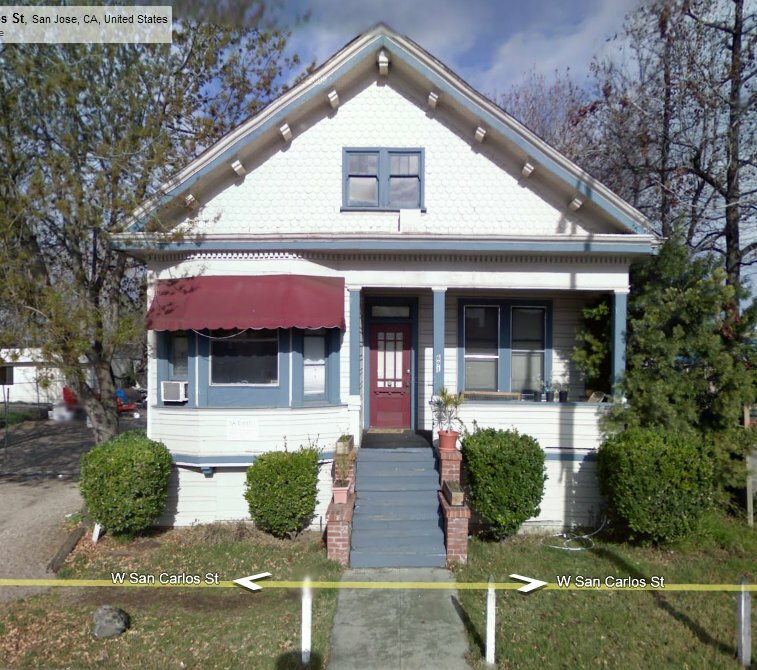 was the former tenant of this cute little 1915 Victorian at 691 San Carlos Street, San Jose. Take a good look, because it is no more. 691 San Carlos Street, San Jose, CA. Before. A four-alarm fire burned the two-story building on Sunday afternoon, June 13th. 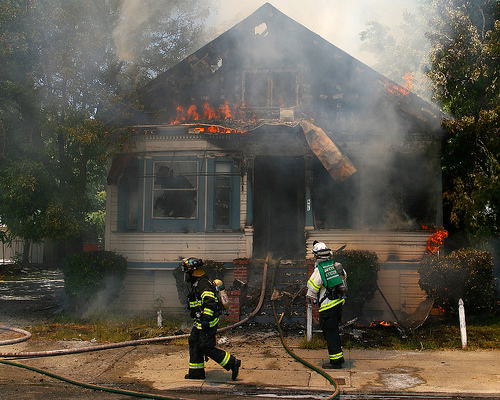 The blaze was reported at 12:30 p.m. at 691 San Carlos Street. Firefighters declared the flames under control by about 2:40 p.m. I wish I could end this post on a positive note, but I can’t. 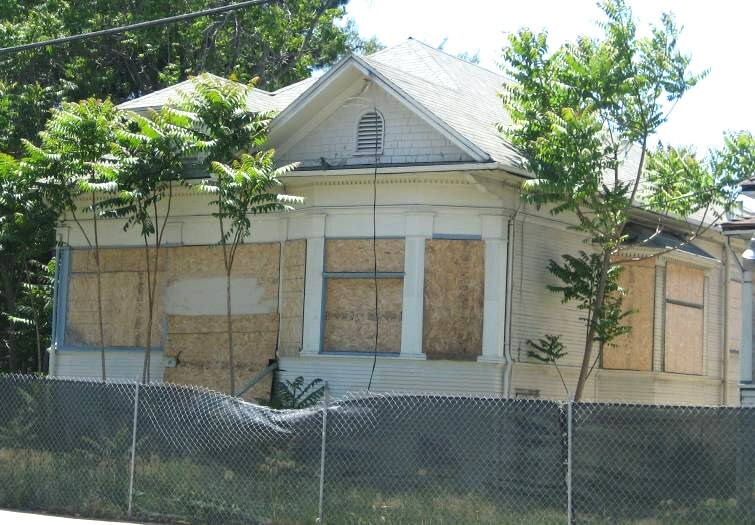 If you have vacant historic buildings in your neighborhood, and you don’t want to see “demolition by neglect”, contact your city councilmember. 691 San Carlos Street. After. Photo Credit: "smokeshowing" on Flickr. Let them know you support new laws to keep abandoned buildings secure and protected from fires. 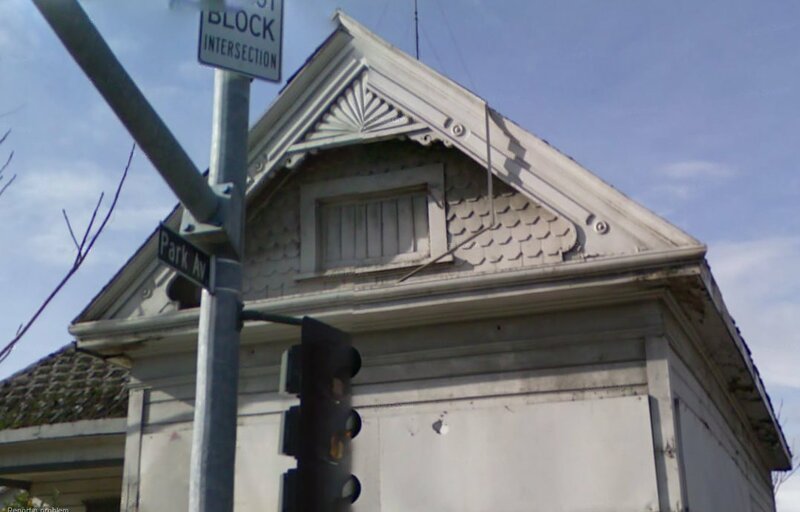 UPDATE: 1/1/2011: The little Victorian at 691 San Sarlos is being rebuilt, and I’m happy to report it looks as though they are restoring it, with historic character intact! The Mansion burned down July 19th, 2007 under “suspicious” circumstances. Preservation Action Council of San Jose had repeatedly made the City aware that it was being broken into and used by vagrants. It was owned Barry Swenson Builders who had proposed building a 200+ unit residential tower on the site. A nonprofit housing organization was working to relocate and rehabilitate the house and use it for offices. We blogged about this here. Apparently this ordinance didn’t do a thing to stop the destruction of all the above mentioned historic structures. 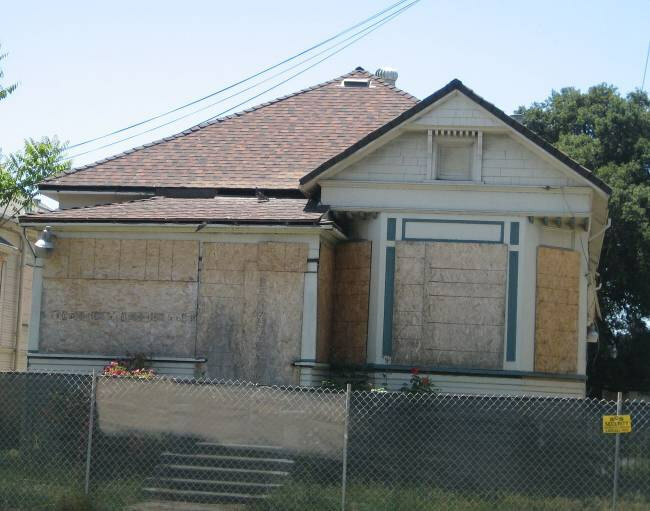 This entry was posted in Historic Preservation, San Jose, Victorian Stuff and tagged Delmas Avenue, demolition by neglect, fire, Park Avenue, San Carlos St, San Jose, vacant building ordinances, victorian. Bookmark the permalink. there is a recent product that was developed that may immediately help in countering this threat to some of the vacant landmarks. One of the larger problems with getting security to a location like these is the cost of cabling, and the lack of a phone line or power for the facility. There is a new product that can help that utilizes battery powered infrared motion sensors and cameras and cellular communication that works wonders in vacated buildings, as well as providing smoke detectors and such in case of accidental fire or even arson. I’d be happy to help or discuss this further. However, if the owner of a building wants the building removed, there is not much I can do about that. Thanks, Scott. I will save your contact info as I am planning a rather intriguing project involving saving vacant buildings from a similar fate. I’ll send you an email as things firm up. L’hanno fatto il film una italiana a New York o siamo ancora in tempo? Purtroppo è troppo tardi per salvare queste vittoriani. Sto lavorando con la città per rafforzare il “edificio vuoto” leggi della città per evitare questo in futuro. Unfortunately, it is too late to save these Victorians. I am working with the city to strengthen the “vacant building” city laws to prevent this in the future. Thanks for such an informative blog post! I just moved into a condo near this lot and was wondering if the city had any plans with it. After some extensive Googling I found this post, and I’m so glad I did. While I still don’t know what they plan to do with the lot, it was such an incite into what San Jose used to be and why it is the way it is today. Thanks for taking the time to research this. Jennifer Emmer is a Feng Shui Master, Interior Designer and Business Owner with over 18 years experience, and hundreds of clients. She was recently named one of the "Top Ten Most Influential Feng Shui Experts in the World" on Twitter. She has designed homes, offices, businesses, movie studios, pilates and yoga studios, bed and breakfasts, and yachts on the West Coast, East Coast, the middle U.S., Europe and Asia. She is also passionate about Historic Preservation, and especially the adaptive reuse of historic buildings. Sell Your Home 82% Faster! Click on the dog to EMAIL us if you know of any historic buildings that are threatened! B on Mystery Victorian of the week!